Black and white New York City photography. like a snowglobe resting between giddy shakes of joy. 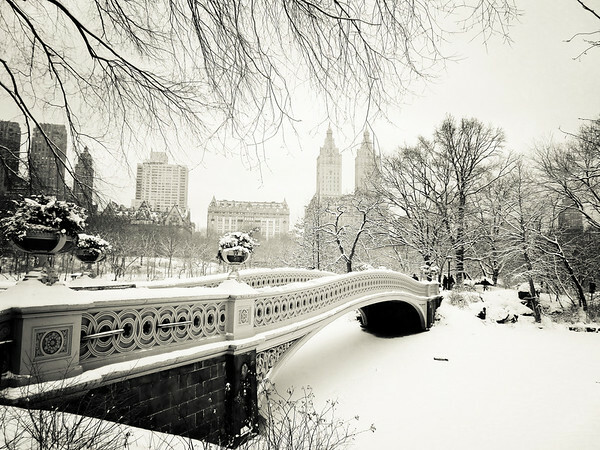 Bow Bridge is one of Central Park’s most iconic structures. It was built between 1859 and 1862 and is shaped like an archer's bow. This particular image was taken during a snowstorm in Central Park, New York City. Bow Bridge sits covered by a beautiful layer of freshly fallen snow as the buildings that line Central Park West sit in the distance just past the snow-laden trees. Gorgeous winter scene. Nicely done.